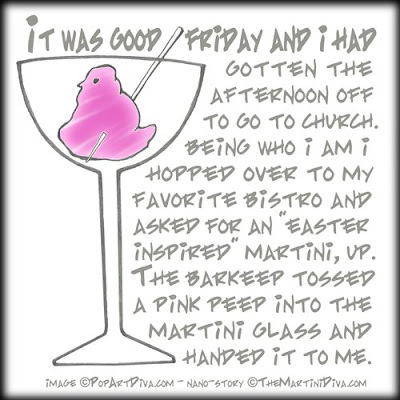 The MARTINI DIVA: Martini Nano Fiction - THERE'S A PEEP IN MY MARTINI! Martini Nano Fiction - THERE'S A PEEP IN MY MARTINI! Number Four of my really, really short stories of martini fiction! Take a short break from your everyday life and ponder the wonders of the "cocktale" world. A novel ideal for happy hour from The Martini Diva. HAPPY READING & HAPPY EASTER - WATCH OUT FOR PEEPS!